mrs sew & sow: Autumn! When I think of Autumn I think orange, brown, red, deep purple. I think fruit, harvest, piles of fallen leaves, toadstools and butterflies! When we lived (before kids) in London there was a pear tree at the bottom of the garden with too many pears for just us to enjoy. I left some rotting ones for the birds but was surprised to see the butterflies clustering around the fruit to drink in the sweet sticky mess! This is the beginnings of an ATC (Artist Trading Card) that I'm making for my partner in the Very Berry Handmade ATC Swap. The theme is Autumn and I'm hoping that my partner likes this - or will when I've finished. Bit more stitching required but I can only see well enough in good natural light and quite frankly we haven't had much of that today! It is 2.5" by 3.5" big - or rather small! You can maybe just see my pencil guideline to keep me within the bounds of the swap rules! So do tell me - what does Autumn (or Fall) mean to you? That'll be the Glasgow autumn then. 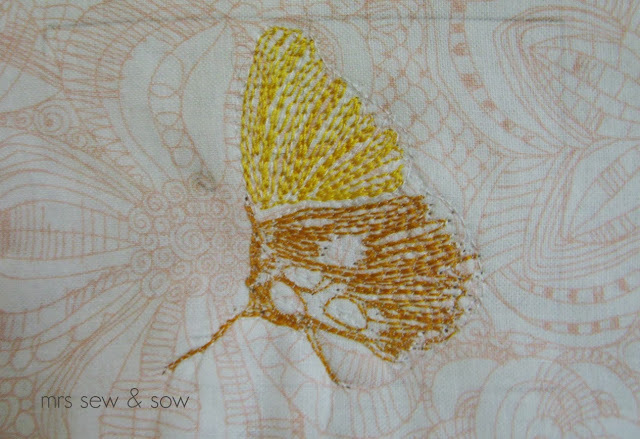 Great photos Nicky, and your butterfly embroidery will be lovely as an ATC. Autumn means wonderful golds, russets and browns against a perfect blue sky and if we are really lucky in France next week, gaggles of geese flying home high overhead. wow - that is so intricate! Love it! Autumn = sweater weather and an end to the blistering heat of summer. Time to get out my favorite clothes...jeans, and hoodies and cuddle up under a quilt. That butterfly is going to be amazing when you are done.